RoofCrafters’ On-site Manufacturing Means Quality Control, From Top-to-Bottom. Unlike many of our competitors, RoofCrafters custom makes most of the accessories for your metal roof out of the same 24 gauge steel as your roof — things like your locking “d” edges (metal edge), ridges, valleys, and other miscellaneous flashings that particular applications require. Because accessories and how they’re made play an important role in the quality of your roofing job, we spend a lot of time in our metal shop fabricating your flashings and accessories before even coming onto your job site! Remember that we don’t just do Austin metal roofing: we serve Round Rock, Pflugerville, Leander, and the suburbs as a top metal roofing contractor. 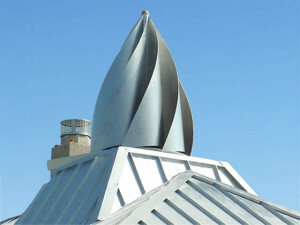 Ask your Project Planner more about what sets RoofCrafters’ roofing accessories and flashings apart from the rest. Want to finish your premium roofing job in a way that really sets your home or business apart? Add a custom chimney cap and/or custom made gutters that are made from the same materials as your roof. These are built to last!